As Regina tries to break the sleeping curse, things get even worse for Snow and Charming. Meanwhile, Rumple and the Black Fairy come face-to-face. 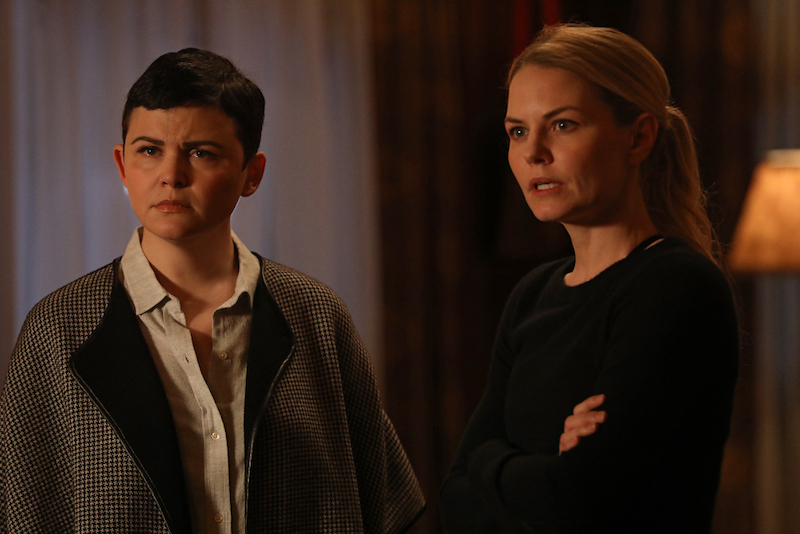 Get a sneak peek of tonight’s Once Upon a Time! Last week’s Once Upon a Time (“Mother’s Little Helper”) brought us a very big reveal about the true nature of Gideon’s intentions in Storybrooke. In present-day Storybrooke, Gideon demanded Emma’s help to destroy the Black Fairy, in exchange for Killian’s return. She was understandably upset with Gideon’s manipulations and even hit him. But it was clear that he wouldn’t budge…he had sworn to free those in the grasp of the Black Fairy and he would do anything to defeat her, even bully Emma. The next day, Emma and Snow went to Rumple to get answers. He confirmed that the Black Fairy was his mother and had tortured Gideon. At the same time, Belle encouraged Emma to help Gideon, so her son could be on the side of good. Rumple also noted that if the Black Fairy entered their realm, it would be even worse… she was the source of the Dark Curse and all the darkness. Emma found Gideon in the clock and agreed to help him. As a sign of good faith, Gideon gave Emma the sword and the spell to get Killian back. They would need to go to the Sorcerer’s Mansion, a nexus for magic. They could create a portal that would allow them to get to Killian. Before they could begin, the Black Fairy intervened and sent a message… a giant spider! They were trapped… but things got even worse when Gideon turned on Emma. He brought the spider there and planned to have the spider kill her and then channel Emma’s powers to open a portal. Since she was the Savior, Emma’s magic was the only thing powerful enough to cut through to the Black Fairy’s dimension. The spider wrapped Emma up in its web, which allowed Gideon to start tapping her power with the sword. Back at the clock tower, he cut open a portal. But before Emma died, Rumple intervened at the mansion and released her. Together they killed the spider. But as far as Emma and Snow were concerned, there was no redemption for Gideon. Yet, according to Rumple he would prevent any threat to his son. A major conflict was brewing. We also had an extended flashback to Gideon’s time with the Black Fairy. She kidnapped baby Gideon and took him to her lair. The Black Fairy held several people captive in her Dark Fairy Dust mines. As Gideon grew up, he held onto hope from a fairy tale book that his real mother had given to him. He also had a dear friend, a fellow captive named Roger, and they shared the story together. Gideon wanted to be a hero like his mother. But when the Black Fairy realized that he had taken the book, she punished Gideon by taking Roger away. When he failed to intervene, the Black Fairy called Gideon a coward. Years later, the Black Fairy surprised Gideon on his 28th birthday. She wanted to celebrate how he had become a great sorcerer. Unfortunately, things took a turn when Black Fairy (supposedly) realized the key to her vault was missing. Gideon promised to find the thief and set off to interrogate the miners. When Gideon arrived, he was met by his old childhood friend, Roger, who was still alive! Roger admitted to taking the key and encouraged Gideon to help them defeat the Black Fairy before she created another dark curse with the dust. How? They had to reach the Savior in another realm with a magic orb. Before they could use the orb, the Black Fairy stopped them. It was all one of her manipulations. Gideon was upset and refused to be intimidated. He was a hero and wouldn’t let the dust be used for evil. When Gideon tried to use magic against the Black Fairy, she turned Roger into a bug and killed him. Then she yanked Gideon’s heart out of his chest… she had plans for the Savior, and Gideon would help her, no matter what. So, the Black Fairy had been controlling Gideon this whole time, and in Storybrooke, the portal had opened up just enough to let the Black Fairy through. UHOH! Meanwhile, Regina worked to undo the Evil Queen’s curses. She had been successful, except for freeing Snow and Charming from their shared sleeping curse. When Henry was jotting down a list of ingredients, he went into a trance and starting frantically jotting down (what looked like) nonsense. Was it the Author powers? Well, in order to learn more, Regina decided to visit the previous Author, Isaac (who was being held prisoner. Isaac agreed to share what he knew, but first he wanted to go back to New York, a sports car, and Hamilton tickets (LOL!). According to Isaac, Henry’s Author powers were taking over, leading to more intense trances. Why? They had reached the final chapter in the fairy tale book. This meant that the Savior would fight the final battle, and no one would want to be around to see that. Sadly, there aren’t any promotional images from “Awake”, but we do have two clips from the upcoming show to share! In the first, Regina and Zelena have developed a potion to rid Snow and Charming’s heart of the sleeping curse; however, things go very wrong. And in the second clip, Killian is cornered by the Lost Boys in Neverland, but gets help from Tiger Lily. Of course the Evil Queen built a fail safe into the curse. Now we really have to find out how we’re going to save Snow and Charming! Also, I though Tiger Lily was our friend… YIKES! Join us at 8:00pm ET to live tweet tonight’s new Once Upon a Time on ABC!